Each of the two sets in the final concert performance of the 2016 Outsound New Music Summit, which took place last night at the Community Music Center in the Mission, promised to offer a unique take on innovation. In both cases the promise was filled; and, in at least one of them, it was fulfilled in unexpected ways. However, both sets had the misfortune of continuing long after that innovation had been established and had run its course. The performance definitely involved in-the-moment encounters both of each performer with her respective instruments and of the two of them with each other. As usual, Dunkelman explored a wide diversity of sonorities with the percussion instruments at her disposal and this involved working with an equally wide range of dynamic levels. This provided Ateria with no end of fascinating opportunities for capture and electronic processing. Nevertheless, the electronics tended to be consistently far more assertive than the percussion; and at least one of Dunkelman’s rolls on a suspended cymbal with soft mallets was, for all intents and purposes, inaudible, even with a microphone placed above the cymbal itself. The set was structured as a series of short pieces. These initially established just how unique those “ever present” moments could be as each involved its own unique logic and rhetoric of instantiation. However, after about three or four of these pieces, those moments began to lose their uniqueness. The set itself ran for over an hour, but it was definitely overstaying its welcome by the time 45 minutes had elapsed. 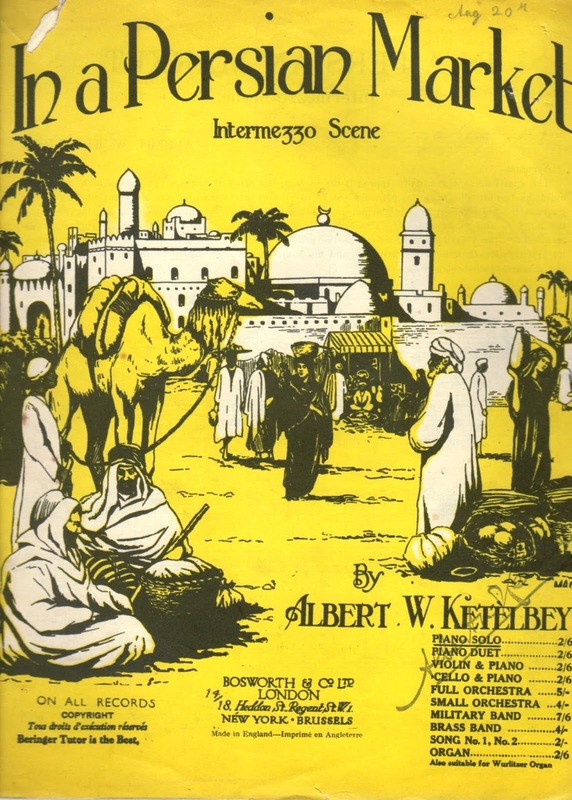 According to the program book, the second set would consist of “a unique version” of a light classics warhorse by one of the most prodigious breeders of such stallions, the English composer Albert Ketèlbey, “In a Persian Market.” The performers were the Big City Orchestra (BCO), led by founders Das (percussion) and Ninah Pixie, whose “wind” instruments included different varieties of accordion as well as those controlled by human breath. They were joined by percussionist Suki O’Kane, Polly Moller on flute and bass flute, and Andy Cowitt on bass guitar. 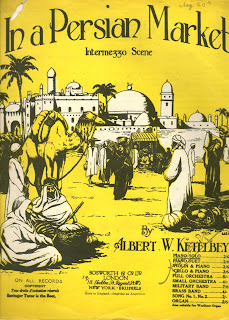 “In a Persian Market” became a popular item at the sorts of light music concerts offered in this country by the Boston Pops. It also received a generous amount of air time on classical music stations such as WCRB in Boston and WQXR in New York after they had taken up a policy of not being too demanding on their listeners. Needless to say, the music now sounds pretty dated but can still provide some amusement with its own brand of hokey charm. According to Pixie, BCO was drawn to the piece when she first encountered the sheet music. Had they just decided to arrange that sheet music for their rather unconventional instrumentation, that would have been a source of mild amusement, if not an opportunity for a few healthy belly laughs. However, they decided that they would provide their own establishing “sound effects” (one of which appeared to be an actual pile of sand in which a metallic ball was rolled) that would interleave with Ketèlbey’s phrases, all played at a tempo significantly slower than the score specified. This made for an intriguing piece of conceptual art; but, in practice, it became a rather hard slog very quickly. True to its subtitle, the piece really is a ternary form intermezzo; but, for this listener at least, patience ran out long before that middle section was anything more than a mirage on the horizon.